Fortekor There are 3 products. 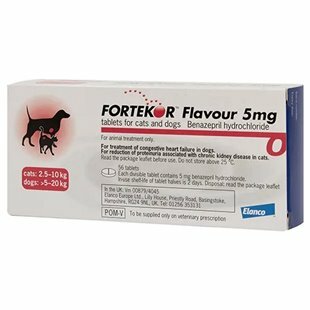 Fortekor tablets are indicated for the treatment of heart failure in dogs and chronic renal insufficiency in cats. The active ingredient of Fortekor is Benazepril. Fortekor is available in 2.5mg, 5mg and 20mg Tablets Fortekor reduces the constriction of both arteries and veins (and so lowers blood pressure and improves kidney function), reduces the retention of sodium and water by the kidney (something that contributes to the signs of heart failure) and helps to prevent some of the changes that occur to the anatomy of the heart in cases of heart failure. In Dogs with Heart Failure, Fortekor reduces the blood pressure and volume load on the heart. Fortekor produces an extension of the life span and also improves clinical signs, notably reduction in coughing, and improvement to the quality of life. In Cats with Chronic Renal Insufficiency Fortekor reduces the protein loss in urine and reduces systemic and intraglomerular blood pressure. Fortekor increases the appetite, quality of life and survival time of the cats, particularly in advanced disease. Fortekor should be given orally once daily, with or without food. The duration of treatment is unlimited. The dose of Fortekor may be doubled, still administered once daily, if judged clinically necessary and advised by the veterinary surgeon. ACE inhibitors are a form of medication for the control of high blood pressure, and the treatment of kidney disease and cardiovascular disease. Studies have proven that correctly used, ACE inhibitors can prolong the life of dogs with heart failure, improving their quality of life and reducing their associated symptoms. ACE inhibitors are generally prescribed for dogs with heart conditions, or for cats with chronic renal insufficiency. ACE stands for “angiotensin-converting-enzyme” (inhibitor) and medications of this type were first approved for use in people, before being trialled and tested as a veterinary drug for dogs and cats. ACE inhibitors were initially approved for the treatment of hypertension, but were later found to be helpful in the treatment and management of other conditions of the heart and kidneys, including heart attack, cardiac failure, and the kidney complications of feline diabetes. ACE inhibitors can help to prolong healthy kidney function in the case of cats with chronic kidney failure and systemic sclerosis of the renal tissue. When used to treat heart failure, Fortekor is usually prescribed in combination with other medications, such as beta blockers, but may be prescribed alone. Some commonly prescribed ACE inhibitors for dogs include Cardalis, Benazecare and Fortekor, while both Fortekor and another product called Benefortin may be prescribed for either cats or dogs. How do ACE inhibitors work? The primary action of ACE inhibitors is to stop the body from producing a hormone called angiotensin II. In order to do this, ACE inhibitors block the chemical enzyme that converts angiotensin II in the body, which has a range of positive effects in the animal being treated. The main actions of the medication is to relax the blood vessels to decrease blood pressure, and to reduce the amount of water absorbed by the kidneys. The body maintains and regulates blood pressure in two different ways: the first is by the resistance of the blood vessels themselves, which is increased when the vessels constrict, and reduced when they dilate. The second depends on how much blood the heart is pumping, which is known as the cardiac output. The figure for any given pet’s blood pressure is the result of these two things, and so will be high if the heart is pumping hard and the vessels are constricted, or low if the heart is circulating blood at a low rate, and the vessels are dilated. Fortekor works by targeting both the blood vessels and the rate at which the heart pumps blood, and this is how ACE inhibitors can help with heart problems and blood pressure. When it comes to the kidneys, the action of ACE inhibitors can also help. Blood is made up of both red blood cells and plasma, a type of fluid, and the kidneys control how much of this plasma is retained within the bloodstream, and how much is passed out as waste in the urine. If the kidneys retain plasma, this increases the amount present in the blood, and so, the volume of the blood in the body itself rises too. When the kidneys identify a drop in blood pressure, they release a substance called renin into the bloodstream, which works with another chemical to form angiotensin I. Then, enzymes affect angiotensin I to convert it into angiotensin II, which is the hormone mentioned above. Angiotensin II helps to constrict blood vessels, allow the kidneys to reabsorb plasma, and releases a hormone called aldosterone, which itself contributes to water absorption by the kidneys. All of these things serve once more to constrict the blood vessels, and increase blood pressure. Fortekor prevents angiotensin I from converting into angiotensin II, reducing the amount of angiotensin II in the body that is available to cause the blood vessels to dilate. This in turn leads to the amount of plasma fluid returned to the body by the kidneys decreasing, reducing blood pressure. What animals may be prescribed ACE inhibitors? Fortekor can be prescribed for dogs or cats, and are given in oral tablet form. ACE inhibitors come under various brand names, but all are POM-V medications, meaning that they can only be dispensed with a veterinary prescription. Fortekor may be prescribed for dogs with various types of cardiovascular diseases including chronic heart failure or congestive heart failure, and hypertension or high blood pressure. Fortekor may be prescribed for cats with renal problems, such as chronic kidney disease, renal failure or the potential kidney-related complications of feline diabetes mellitus. The usage of Fortekor in dogs and cats is well studied and tested, and such medications are usually well tolerated with few to no side effects. However, like any medication, some side effects can present in your pet, particularly during the early stages of treatment. Keep an eye out for symptoms such as vomiting and diarrhoea, low blood pressure, dizziness and gastrointestinal disturbances. Always speak to your vet if you have any concerns, and do not stop giving the medication without your vet’s advice.